April 27 (UPI) -- The families of Japanese abductees who are still officially recognized in Tokyo say they are hopeful about being reunited with their relatives on Friday, according to a Japanese press report. The families watched the Inter-Korea Summit and cautiously welcomed engagement between South Korean President Moon Jae-in and North Korea's Kim Jong Un, Kyodo News reported Friday. Sakie Yokota, 82, mother of abductee Megumi Yokota, said she hoped the situation will improve as North Korea moves away from provocations. Yokota also said she will watch "how things will unfold" because of past experiences with North Korea reneging on meetings regarding the abduction issue. Ahead of the summit, Moon had told Japanese Prime Minister Shinzo Abe he would raise the issue of abducted Japanese nationals with Kim. Abe, initially a skeptic of engagement, said Friday he welcomes the summit agreements, South Korean news agency Yonhap reported. "I welcome and take them as positive moves," Abe said. "I want to praise the South Korean government's efforts that led to the latest summit...Japan will solidly unite with South Korea and the United States, as well as with China and Russia, for the resolution of abduction, nuclear and missile issues." Ethnic Koreans in Japan said the summit raised their hopes for unification and denuclearization. Pak Chae Hwa, 63, told Kyodo the summit was a "dream come true." "If [the outcome] leads to an improvement in North Korea-U.S. and North Korea-Japan relations, the status of North Koreans living in Japan will also improve," Pak said. The issue of Japanese nationals in North Korea has been a contentious matter between the two countries ever since 2002, when former North Korean leader Kim Jong Il admitted to the kidnappings. After North Korea allowed five Japanese abductees to return, it has maintained eight others died and another four were never taken to North Korea. 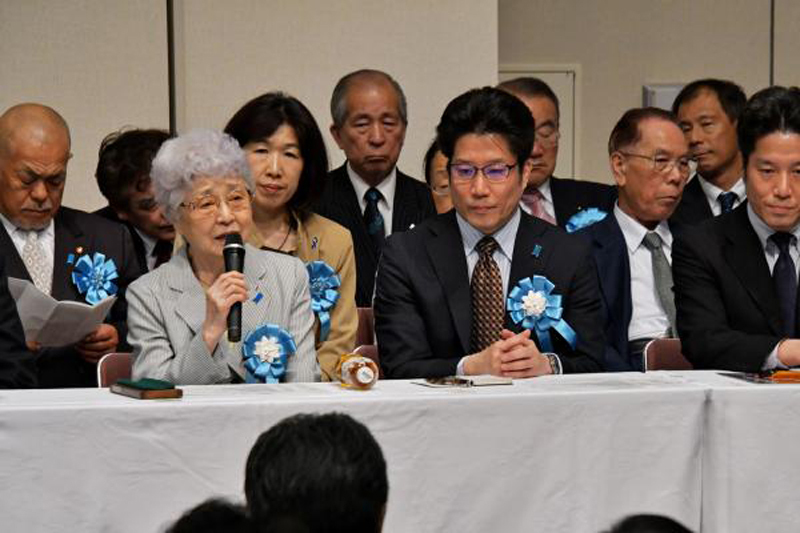 A dozen abductees are still officially recognized by Tokyo.